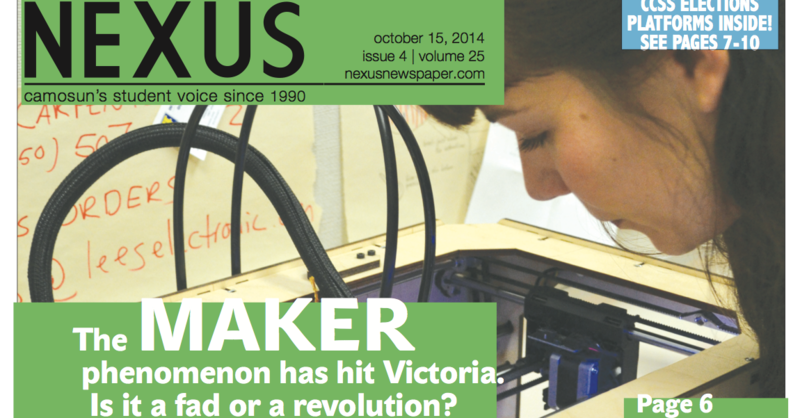 The Maker Lab is featured in the cover story for the current issue (25.4) of Nexus, the student newspaper for Camosun College in Victoria, BC. Written by Jayden Grieve, the article profiles the MLab alongside the Victoria Makerspace as well as an emerging makerspace in Camosun’s Department of Mechanical Engineering. In so doing, it highlights the growing popularity of DIY spaces and culture in Greater Victoria. The piece also contains some of Jentery’s reflections on his inspiration for engaging in DIY, and it features several photos of Nina at work on the Kits for Cultural History project. Nina is even pictured on the cover! Thanks to Jayden and Nexus photographer, Jillian Westby, for all their work on this publication! Post by Shaun Macpherson, attached to the Makerspace category, with the news tag. Image for this post courtesy of Jillian Westby and Nexus.